Tis the season, Girl Scout Cookie Season that is. It’s similar to Christmas in that you have to shell out funds every time you walk into a retailer, grocery store, gas station, etc. etc. but instead of shoving a dollar into a red bucket for a half-hearted ‘thanks’ you shell out $3.50, but you also get cookies… and you make some kids happy, but seriously it is really about the cookies. I don’t have kids of my own, so I feel very comfortable disappointing children. I’ll give money to charities that I feel are worthy, but just because a cute face is peering up at me I’m not going part with my cash so some 8-year-old can go to Europe. And there is no way I am letting a kid wash my car for charity. As I child/teen I participated in these fund-raisers and I can tell you we did a terrible job washing cars, and honestly probably damaged some in the process. Christi of Dirt Plate out did herself this week with beautiful Thin Mint Muffins. I will definitely will be trying her recipe out this weekend. Go check her recipe out for yourselves. 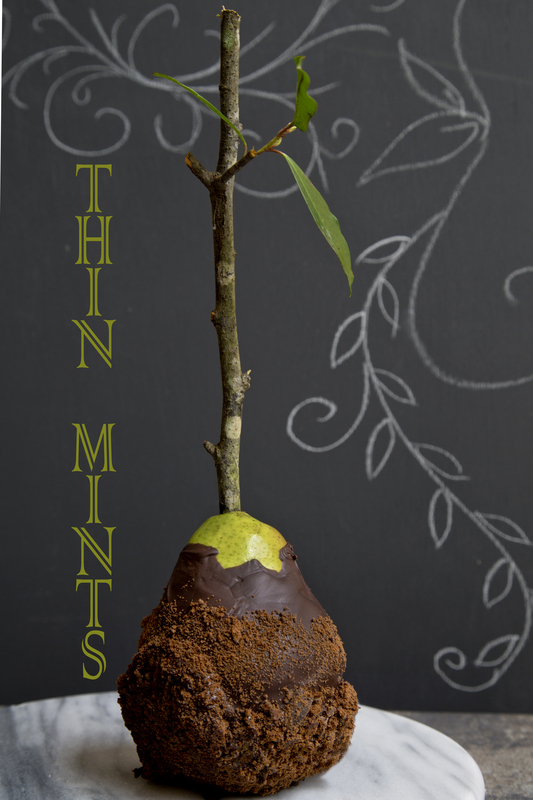 I’m partial to thin mints, especially frozen (yum), so I made thin mint chocolate covered pears. I thought pears were a nice change from apples, which I did last week. 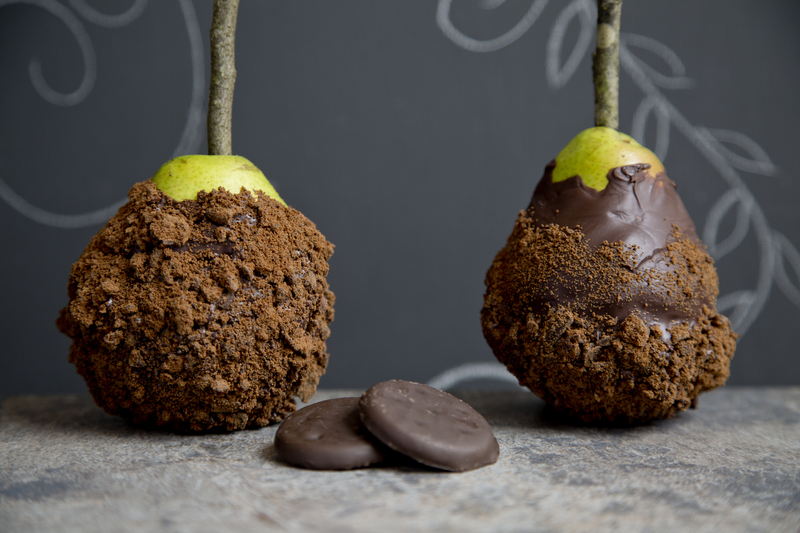 Plus pears with chocolate are delicious! In my caramel apple post I totally forgot to buy craft sticks, so I had to cut branches out a tree mid-way through the recipe, but it turned out pretty nice. 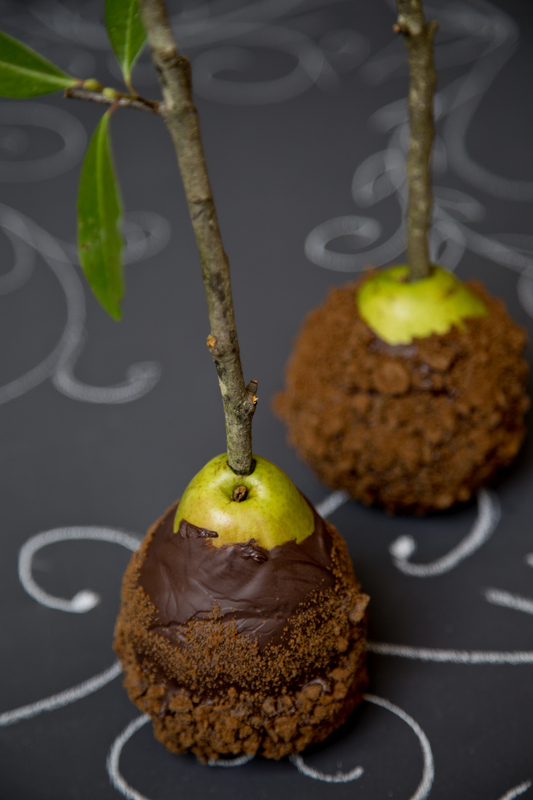 I thought I would try it again with the pears. 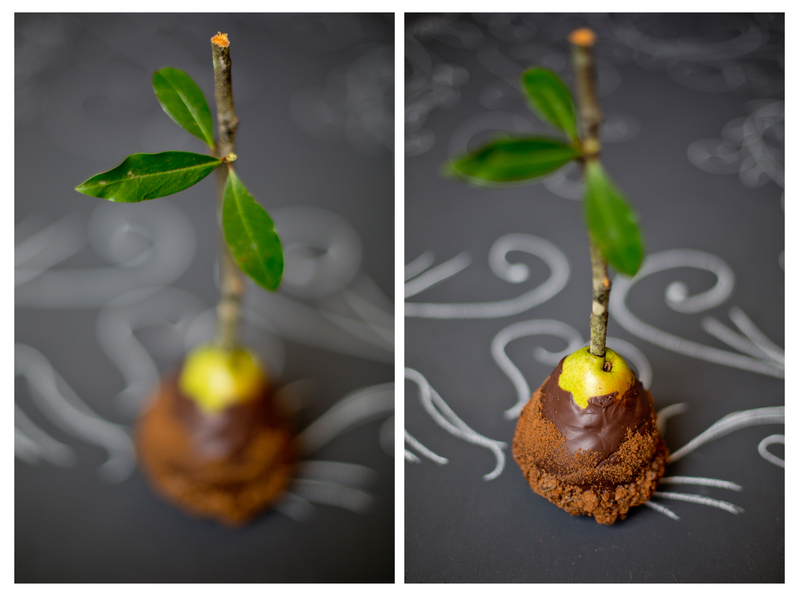 This time I was able to get a branch with a little leaf on it which was an added bonus. The incredibly easy recipe below. Peppermint Extract-You can also make your own extract with a recipe from Dirt Plate. Check it out! 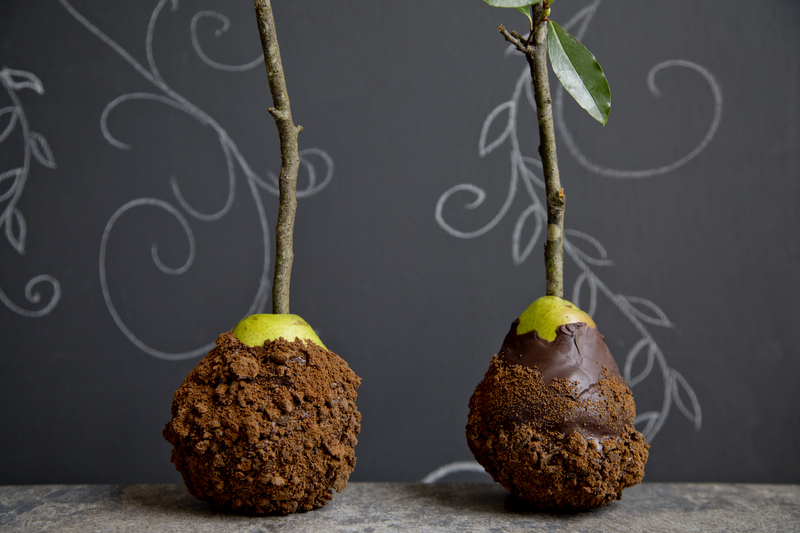 Insert cleaned branched into the stem end of each pear. Melt the dipping chocolate per its instructions and after it is melted add 6 drops of peppermint extract and mix into the chocolate. 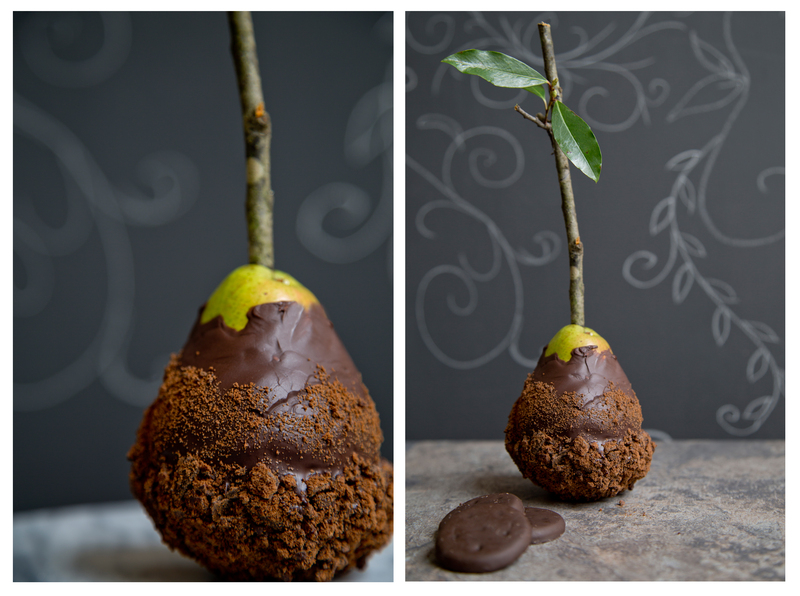 Immediately dip pear into the chocolate for a nice even coat. (As you can tell from the photographs I did not get a nice even coat, but a thick lumpy coat. It still tastes good, but it isn’t as pretty). While the chocolate is still melty roll in the crushed Thin Mints. Place on a baking sheet covered with parchment paper and let cool thoroughly. Enjoy knowing you made a girl scout happy, unless you don’t like children and then just enjoy! For other fruits on sticks and Girl Scout Cookie inspired recipes check out my: Samoa Caramel Apples. Categories: Recipe | Tags: Chocolate, Cooking with Cookies, Cooking with Girl Scout Cookies, dessert, Dirt Plate, food blog, Girl Scout Cookies, Girl Scouts, Pears, recipe, thejealouscrumpet, Thin Mint covered pears, Thin Mints, Violet Henri | Permalink. how delish! My daughter is a Girl Guide here in Australia & recently we had to sell boxes of cookies but they were NOTHING like this – in fact they were very bland & uninspiring! That’s too bad the cookies are bland. I have to say the States cookies are pretty tasty, not healthy, but tasty. I don’t like all of them, but I have my favorites that I pick up once a year. What do you have? *gasp* That is a terrible selection. I wish I had some left over I would send you some. It is a shame for you to miss out. Although I’ve heard you have many wonderful sweets that we can’t get here. 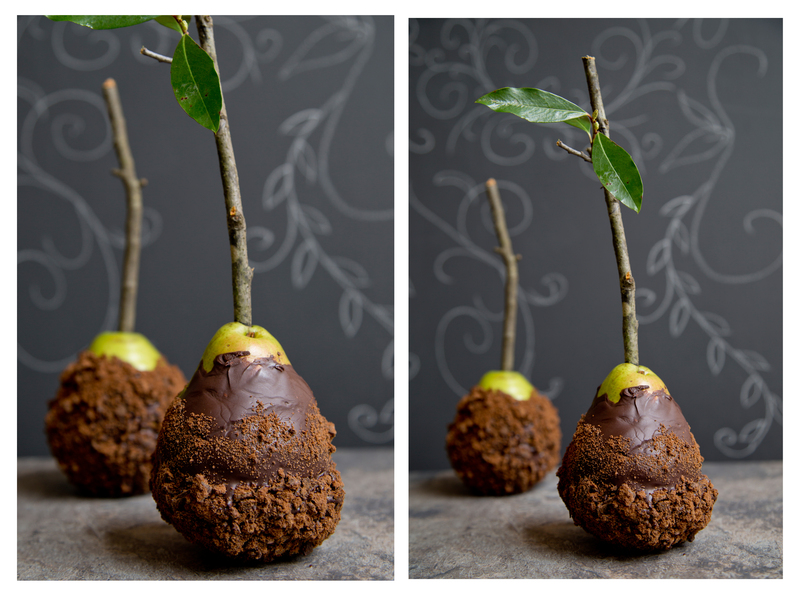 Ohhh My…I didn’t tried your pear wrapped in an elegant chocolate dress yet…but for sure I love your photos already!!! Thank you so much for following, it offered me the oportunity to discover your beautiful blog…thank you…and now following. Thank-you for the complimentary words and follow! I am excited about following your blog as well. It is impossible to find good, natural beauty products. If I’m in the kitchen making desserts I might as well whip up some natural facial scrubs too! Smiling….that s what French think about themselves….the truth…I love the English version!! Thank-you Elle! I will definitely try to participate in the Liebster Award. I’m looking forward to following your blog! This is so creative… I love it!